Most people planning to visit Almuñécar will be flying into the Málaga Airport (AGP) and this means driving from Malaga Airport to Almuñécar. While it is just about a 1 hour drive to the center of Málaga from Almuñécar, I would allow about 1 hour and 20 min from the airport. The Málaga Airport (AGP) is located on the west end of the city and Almuñécar is to the east. Once you are on the highway, it is smooth sailing and easy to reach. Do look out for the speed cameras, as you will want to avoid paying the 100€ – 200€ speeding fine. There is a website which provides the location of all the traffic cameras, but there is also excellent signage along the highway. The road sign is bright blue and says “Control your speed”. This likely means there is a radar camera approaching and it will either snap your speed as you pass the camera or it may be a distance radar or a radar section. If this is the case, it will take your speed upon passing a point and then after a distance there is another checkpoint and a camera. If you pass through that zone too quickly, it will take your photo and you will have a speeding ticket. In the chart below, the far right column denotes the kilometer marker point when the radar starts and stops. For me, I just like to set the cruise control and not have to worry about it. There are 2 exits for Almuñécar, one just outside the east or west part of town. Depending on where you are staying it could save you time to take the correct exit. The first exit is #305 and is for La Herradura, as well as the west side of Almuñécar. It is about a 5-6 km drive, 15 minutes into the center of Almuñécar from this point. There are many car hire options with very reasonable prices at the Málaga Airport. This option will be about 1.15 hours of driving time to your location. Click here for Spain car hire tips and tricks! When returning your car, check the fuel policy in your contract. Some expect you to return the car empty and others expect it to be full. If it is supposed to be empty, read the fine print closely. There is a chance if you return it full, you will be reimbursed the charge of the full tank you paid for at pick up, minus a service fee. If so, this will likely save you a bit of money. If you want to fuel your car before returning it, just as you are a few km away from the airport, stay to the right on the M21, rather than the M20. Along this route to the airport you will find a Repsol and a BP just before the airport exit, off on the frontage road. The final petrol station BP, which is located just next to the Holiday Inn Express, at the airport exit as well as the Del Paso Car Hire. 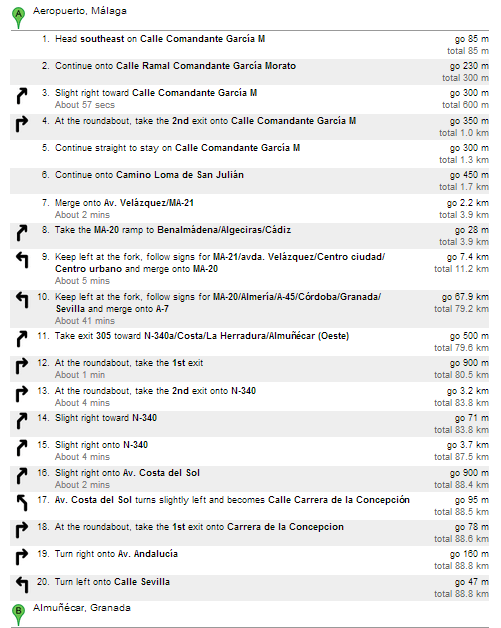 If you are planning on Driving in Spain, you need this guide! Now that we know you have a car while visiting, please be sure to check out some of the Things to do and Day Trips.